On today's menu, the new logo of the 2.6.0 version, some screenshots with the scanlines effects and new windows, and the list of updates that have been made to this day (or almost), and what's to come in the next weeks. The IFSCL is making progress, and this can be felt in the rhythm of news updates! On today's menu, the new logo, visible above, screenshots and the list of updates that have been made. You may notice a global overlay of horizontal lines (like on an old TV set). Hard to integrate due to performance reasons, it's now completely available in the new version, especially thanks to the enormous advance explained in the previous news entry. For the same reason also, in the cosmetic details, the Xana logo on the title screen, in the background, spins, like in the series. 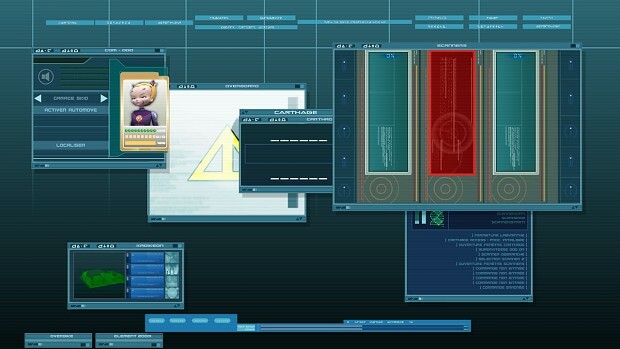 Also, as stated in the previous list of updates, unique portraits of the Lyoko Warriors in their seasons 3, 4 and Translated forms are randomly choosen, that's a lot of portraits! And here's another in-game screenshot. Two new windows are hidden in this screenshot, can you find them? - Improvement: Audio card renamed as "com"
If you have any questions about OTHER eventual updates, please consult the FAQ first of all. But also don't forget that other things will be added in time (not just missions). Finally, you can note that the bottom-left menu on the official site was simplified to make it quicker, the page for the next version and version archive have been merged with the download page. The "next version" and "archive" categories will therefore be removed soon. This list will grow, of course. Don't hesitate to look at the download page cited here from time to time. Don't forget that you're always welcome to give feedback on the Facebook page, and follow the game and review it on its IndieDB page, well, here. So this will be the topic of the next news post, on an undecided date. Thanks for the update. Your work on this project is greatly appreciated. By the way. Congrats on beating Minecraft earlier today on the Top 100. Good stuff right there. Looking forward to your next update. Take care. It took you only 11 months! I was pretty sure that you wouldn't finish this before 2016! Anyway I remember the time I though the game would be finished in the end of 2013 hu hu.. A long time ago. But still, for Carthage (knowing that this version won't bring the Skid or the Heart), I trully think It will be completed this year. 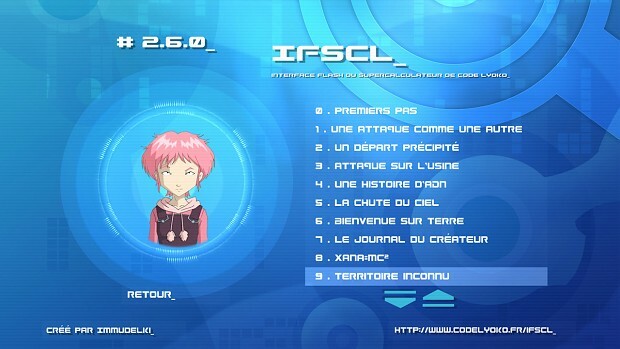 Have you thought maybe to make a code lyoko 3D game and connect it to the IFSCL? May be even contact another developer and make a joint project where you work on the IFSCL and the other developer works on ther 3D game. I know that it is a big project but if it will ever be released it will probably be the best thing ever! Maybe even start a Kickstarter campaign! First : Kickstarter for a fan game is illegal. Second : I know that would be great, indeed, I've thought about that at a time, but IFSCL in itself is way too big. Third : I don't know anybody capable of doing something I would consider good enough for that. (at least doing a reproduction of the supercomputer room in cell shading or whatever, as a start, I'm not even talking of creating a 3D reproduction of the lyokowarriors, since It's what IFSCL would need at least for the transition windows. (ripped models of official game aren't enough, all the costumes are needed)). I obviously understand that this project is almost impossible and will probably never happen, but as a big fan of your game I will try to help as much as I can to make the impossible happen. I know i can't expect you to just start a new project especially of this magnitude but as you said, you did consider the idea before. I have the Email of the creator of Pokemon Generations and he might be the one to model the whole thing, I know it is long shot and I don't even know him personally or if he will even agree. But if you'd consider the possibility of this and might need my help with anything then please contact me.